A photo of a typical small town main streetin the united states of america. 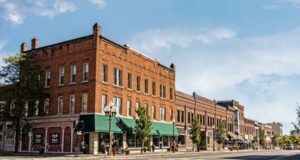 features old brick buildings with specialty shops and restaurants. decorated with autumn decor. In my early prepping years I, like many preppers still today, subscribed to the ‘cabin-in-the-woods-as-bugout-destination’ vision, and I have the mondo-mega survival knife to prove it (I do still love my Becker BK7 survival knife, although lately I’ve come to favor the lighter and time-tested K-Bar Marine combat knife). Somewhere along the way it occurred to me that the number of people in my simplistic scenario would not be sufficient to attend to all the routine tasks of day-to-day life while at the same time maintaining a reasonable level of security. Even if the group could stay vigilant around the clock it would probably be to no avail if the area they controlled was not large enough that the primary dwelling was outside rifle range from the perimeter – otherwise any aggressor could simply pick us off from a concealed location. After considering this for a while I came to realize that a small town addresses all these concerns. I also came to realize that most small towns have important infrastructure such as farms, machine shops, etc. – just the type of infrastructure that could restart a local economy in the aftermath of a major disaster. Such a town could erect military-style roadblocks on all roads leading to the outside world to achieve good security. The additional land within the community, along with some modest agricultural equipment, might also be able to help meet the town’s food needs. Since developing these thoughts I have secured a bugout location in just such a town, and everything I have observed in the intervening 2+ years has only served to reinforce my belief that small towns can serve as excellent bugout destinations. Our book, “When There is No FEMA – Survival for Normal People in (Very) Abnormal Times”, provides detailed instructions for organizing a small town to survive in the wake of a major disaster. It can be previewed and ordered from our web site at http://nofema.com/.